A medical recliner or patient recliner has the main purpose of converting into a comfortable and accommodating Chair, for the needs of a patient or person with a medical condition or injury. There are many different types of recliners on the market that can be used for medical purposes, although the type will depend on the specific requirements of your medical condition or ailment. A regular recliner, is basically an armchair that has a foot and backrest that can be adjusted into different comfortable positions. Whereas a Medical recliner, are similar with the addition of Power Lifting Functions, accommodating features for Dialysis equipment and other medical equipment, certain enhanced comfort features, and different adjustable positions. One of the most popular chairs used for medical purposes by elderly individuals, post-surgery, and even injured individuals are Lift Chairs. Lift Chairs are generally a Powered recliner with the function of being able to lift into an upright position, which allows a person to get in and out of the chair with ease. Most Lift Chairs are available in a variety of sizes and styles, with many features for comfort and support. Anyone struggling with mobility, will greatly benefit from a Lift Chair. 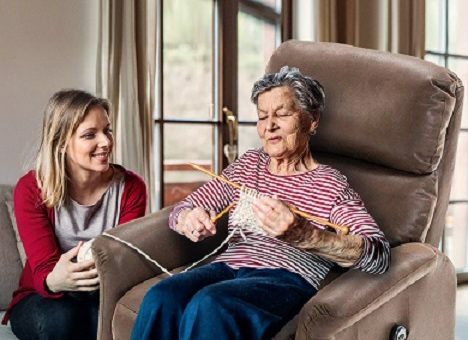 Whether you have had surgery, struggle to get up out of your chair, or even for older persons, a Lift Chair can be an outstanding and highly functional reclining Chair. Lifting function for easy in and out of the recliner. Deep recline and Flat recline positions for comfortable naps. A comfortable and supportive headrest. Easy push back or lever recline and footrest adjustability. A powered option that works with remote controls. Cup holders and Side tray for convenience. Easy to reach storage pockets. Waterproof cover, or moisture Barrier for some patients. Sturdy Steel or Wood Frame. The Lumex from Graham-Field Health, is a Standard in the Medical recliner industry that basically started it all. This is a three position Medical Grade Recliner that offers many therapeutic Benefits to aid in patients struggling with certain health conditions. Features three recline positions that are very easy to adjust. Therapeutic Benefits include; aid in circulation, respiratory ease, and comfort from symptoms of heart disease and other ailments. Position Lock, so the chair can be secured in any of the three positions. Flex-o-Lator seat support with an ergonomic design and varied density foam for comfort. Articulating headrest, that adjusts for maximum individual comfort. Durable steel frame and easy gliding casters for movement. Expoxy Coated frame which is easy to clean and maintain. 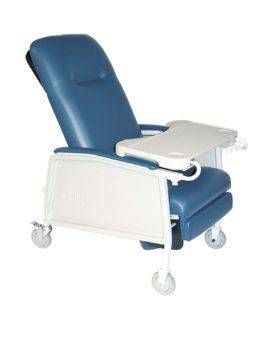 Another superb medical Grade recliner, aimed specifically at patients with conditions that require constant medical care and support. 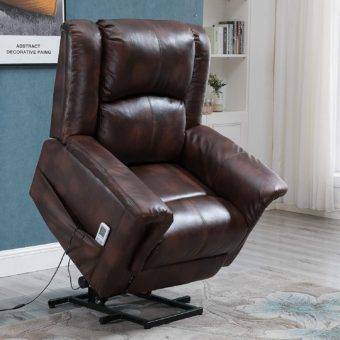 This recliner chair has Three recline Positions, offering deep recline, upright sitting, as well as an elevated leg rest. The retractable lock bar secures the chair in the desired position, and the five caster glide mechanism allows for easy and smooth movement. The armrests are wide and comfortable, with an angle to deliver better support in a reclined position. Neutral colored with an easy cleaning upholstery, and very durable steel frame. Comfortable foam filling and Vinyl upholstery. The Blue Chip Home Medical recline chair is one of the best innovations when it comes to medical care at home. A Core constructed from a highly durable welded bladder, and aqueous pressure redistribution gel. There is a special Certipur foam cushion in the Heel area, for soft support and comfort for your feet and legs. Security straps for safety and precautionary measures when needed, that are strong, comfortable and durable. A Non-Skid Bottom that stays firmly in place. The top cover is manufactured from, Blue Vyvex-III Multi-Stretch material, that is anti-microbial and fluid proof. This is a soft and luxuriously comfortable recliner with the additional function of a Lift chair, which is ideal for persons struggling with mobility. Very easy to operate with a smooth recline and lifting mechanism, remote Control Operated. High-quality Long Lasting Durability, ensured, with this quality and well-crafted product. Heavy-duty lift actuator with a scissor mechanism, for durability and smooth and easy operation. Cloud Nine soft and comfortable upholstery and padding, for the best in support and comfort, to reduce tension and pain. A very user-friendly and easy to operate Medical recliner with Lifting function from BONZY, a well known and trusted brand, that offers the best in durable comfort and support, as well as easy mobility. Remote controlled Recline and Lift functions in different positions. Ideal for Elderly, handicapped and injured or sick individuals, providing more comfort and support, as well as better mobility features. Lifts and slightly tilts so you can get in an out of the chair with the greatest ease. ,strong> pocket storage on the right side, for even more convenience. Plush padding and soft fabric upholstery for comfort and durability. Drive Medical is one of the top brands when it comes to Home Medical chairs. That is why I have chosen a second model, the Geri Chair, which is one of their most popular models in Medical recliners. Features For easy recline positions,which are great for use in dialysis, blood collection, as well as respiratory and cardiac care. A Gas Cylinder controls the deep recline and Trendelenburg position, with an easy release handle on both sides of the recliner. Wide upholstered armrests with an angular shape, for comfort in all recline positions. Comfortable, built-in headrests that support your head and neck to relieve tension and pain in these areas, while aiding with respiratory issues and circulation. Flame resistant Vinyl Upholstery that is liquid proof and easy to clean and maintain. There are five casters with two lock positions for safety, and easy movement without the risk.